Five Penn Manor High School students participated in the first-ever Jobs 1st PA STEM Competition February 3 at Lancaster Lebanon IU 13 headquarters. The team of Mitch Haag, Christopher Stillwell, Alexander Thomas, Jack Whalen and Kevin Ward joined teams from other area schools in the science, technology, engineering and math competition. The Penn Manor students designed and built a portable food bank receptacle that can be placed at any public establishment. It accepts canned goods and flashes when a can is placed inside. The students received assistance from a mentor, Jere Myers, an engineering specialist at Armstrong World Industries. 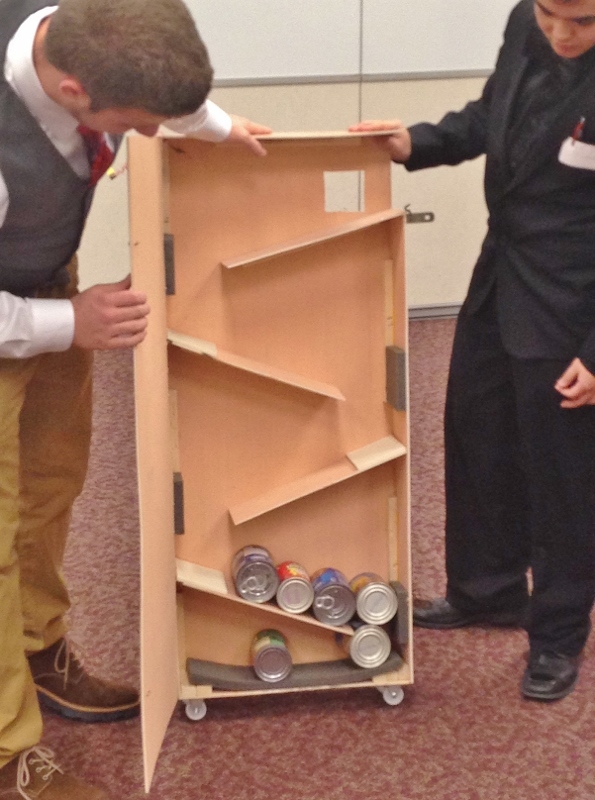 All teams received a $500 stipend to design and build a prototype of a device designed to improve the local community. Students were required to explain the practical applications of their device to a panel of judges. While Penn Manor’s team did not win the competition – only one team advanced to the state round – the experience was invaluable, said Barry Groff, applied engineering & technology instructor at Penn Manor High School. 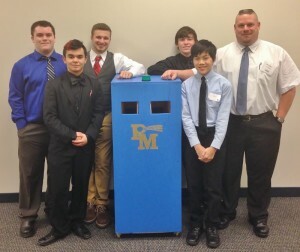 Students pose with their portable food bank receptacle along with teacher Barry Groff, far right. The students are, from left, Christopher Stillwell, Alexander Thomas, Mitch Haag, Jack Whalen and Kevin Ward. Students Mitch Haag, left, and Alexander Thomas display the inner workings of the device they designed and built.